The fourth one is obviously for Missy from Doctor Who. I'm a child of the seventies when dinosaurs and polyester and the Coke song ruled the earth. Writing's nice and neat on the Coke cake. Gerbera Daisy. That's where the confusion started? And they put roses, not daisies on the cake. Are you sure they didn't want this baby on the cake? The Gerber baby is bald, isn't it? Well done, I must say. To be fair, it's a gerbera daisy. So I'd call that one 50% baker, 50% customer. I'm here just to high five CreepyTribble. 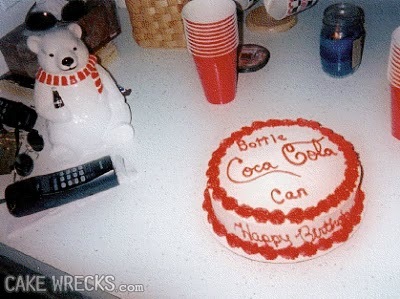 What gets me with cake #1 is that they mimicked the Coca-Cola font, but they do that? Well, at least the Gerber cake is very well done. Can't say that for the second one. I don't think I'd touch it even if it were blank. 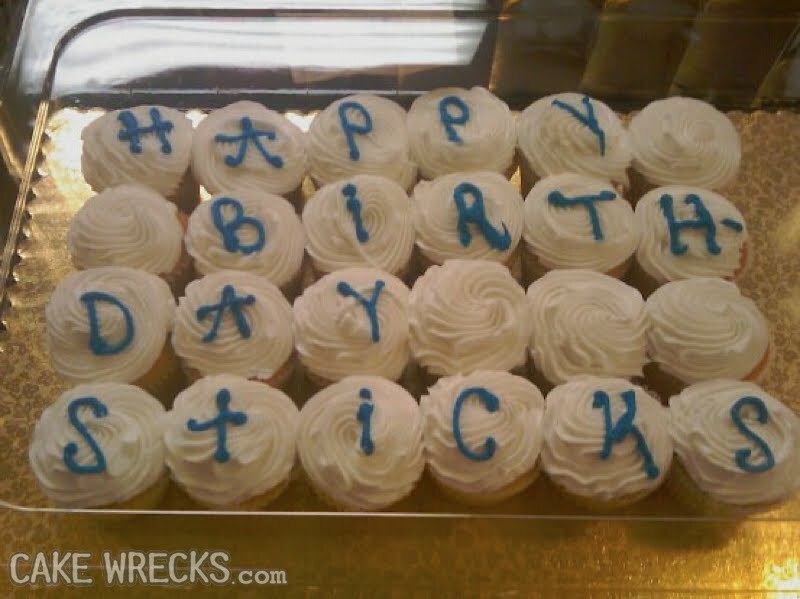 Frosting should not be shiny. "What we've got here is [pause] failure to communicate." There's the problem. As others said, it isn't a "Gerber" daisy at all! What else would you put on a cake when asked to put a "Gerber?" A baby of course! Want a daisy, ask for a Gerbera daisy, or best yet, just a daisy. I admit it freely: I don't get the second cake. At all. What were they asking for? Maybe Kelly is a Labyrinth fan? @SuBee: your comment about being a child of the seventies when dinosaurs ruled the earth reminded me of an incident that happened in college. It was 1993. At this time, I was a senior and still living in the dorms; there was a 70's-themed party going on that night. Two empty-headed freshmen (they were even blonde) knocked on my door and asked me, not to come, but if I had any 70's clothes they might wear. I remember staring at them, and finally saying, "How old do you think I AM?" Now, of course, my kids (all of 11) ask me what Marco Polo looked like, but still seem shocked when told there was no Internet in my youth. Bring a photo. Get a printed color copy (edible paper optional) plasted on top of cake, maybe will frosting on the edges to anchor the masterpiece. Done. Will that be cash or credit, dear? Cake #2 puzzles me as much as it does Christine. All I can think of is an attempt at Roman numerals gone completely awry. Looks like someone accidentally another Coca-Cola bottle. Gerber baby, Gerber baby, Gerber baby. Try saying that three times fast! @SaraCVT, that remindis me of my (about 40-year-old) friend who went to one of the chain drug chains looking for perfume for his wife. The very helpful cosmetics girl showed him several on his list and he picked one and then asked the price. He was shocked. The girl said, "Well, if you come on Tuesday, you can get your discount!" He looked at her quizically then it dawned on him that she mean that he should come in on Senior's Day which is every Tuesday. He asked, rather indignantly, "How OLD do you think I AM?" What's so puzzling about cake #2? 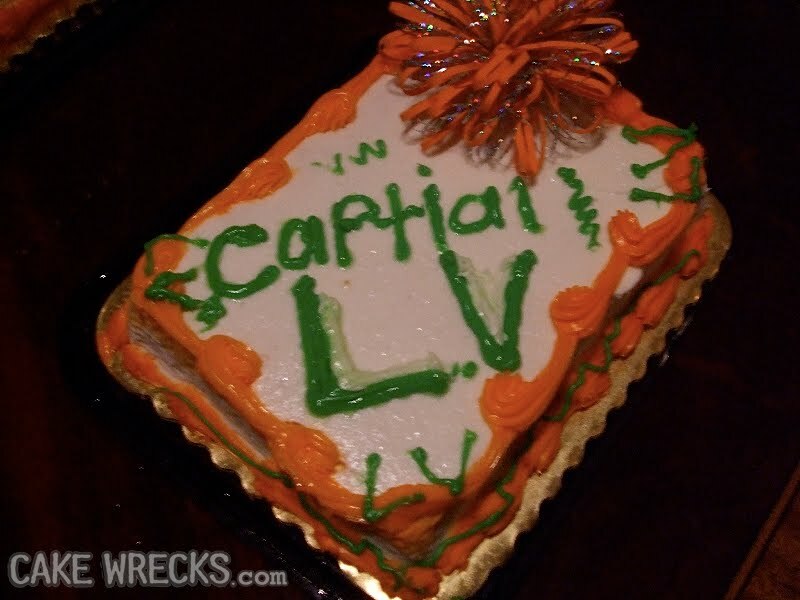 Clearly, they asked for the decorator to write "in capitals, L V" Maybe it was a birthday cake for Lord Voldemort, or maybe it was for a Latin teacher who's turning 55. That doesn't matter. What matters is that they didn't expect "in capitals" (or even "in captial") to be written out. What is heaven's name is a gerber baby?? @lost: Gerber is a line of baby food and supplies in America. The second one was probably supposed to be a Louis Vuitton cake, I'm guessing. And to you "Gerbera daisy" snobs, nearly EVERYONE pronounces it "Gerber". It's not as much of a travesty as you're making it out. The pronunciation must be regional, as I've never heard it pronounced any other way than the correct "Gerbera". I've also never heard it referred to as a "Gerbera Daisy", either - it's just a gerbera, or "those huge flowers that were everywhere in the late 90s". @TheCreepyTribble - I think you're right! What we have here is a failure to commune a cake. Michigan transplant who retired here. She says Gerbera. The Gerber baby cake isn't too bad, except I'm pretty sure the baby had less hair. Am I gong to be the first to bemoan how people have forgotten to communi-cake? I'm going to epcot the gerbera daisy comment. I'm not sure who started the "gerber daisy" thing, but it's prevalent in the wedding industry as well. Every time one of my brides asks me if I know a florist who does pretty "gerber daisies" I barely refrain from rolling my eyes. I am in the South as well. People here also say "pacifically" instead of "specifically." The fact that it's common doesn't make it CORRECT. It isn't. Oh geez. Well the gerber baby cake is kind of cute lol. As for the rest of them.. 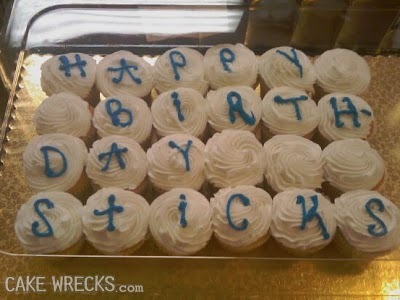 I will just have to make my own cakes from now on just so this can't happen to me lol. That top one looks just like a classic Coke bottle cap - yes, with both "bottle" and "can" written on it. I really can't fault the person who made the Gerber baby cake. The cake requester must have assumed that everyone is an expert on horticulture. If I had a request that sounded like that, I'd interpret it as "Gerber baby" as well. I hadn't even heard of "gerber daisies" until a few years ago when there was a similar item on Cake Wrecks and a commenter pointed out he almost made a similar mistake when a customer asked for a "gerber daisy" on a cake. Perhaps the cake decorator should have asked the customer if they meant a "gerbera hybrida" daisy or a "gerbera viridifolia" daisy. Or perhaps a "gerbera jamesonii" daisy? Y'know, I'm not convinced the Gerber Baby cake really IS a Gerber Baby cake. 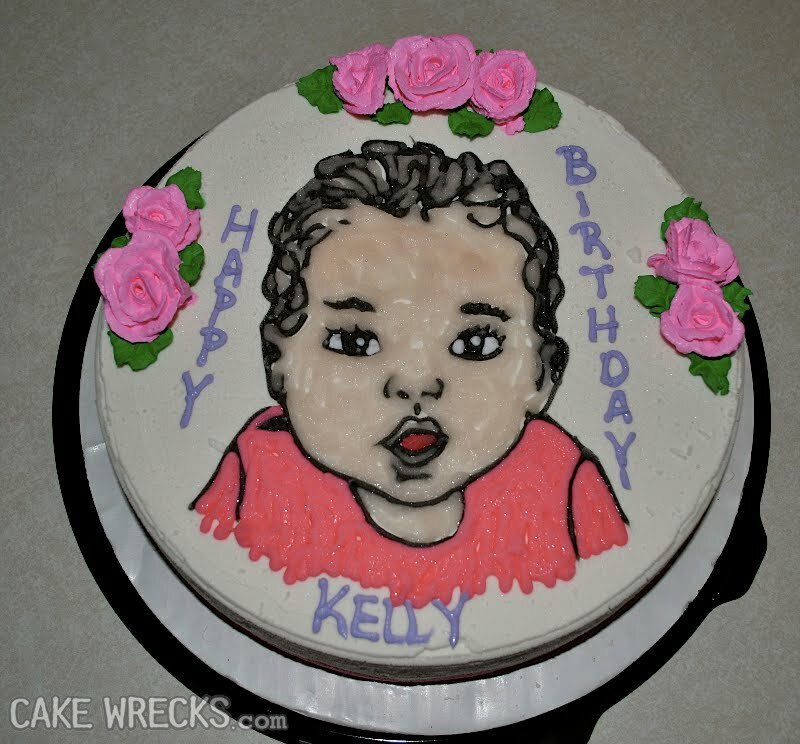 On checking the logo against the actual cake, the Gerber baby is younger, has less hair, and isn't wearing a pink shirt. 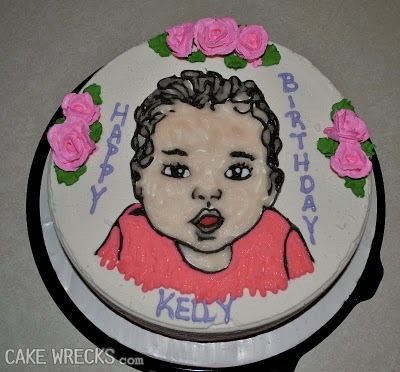 The more I look at this, the more I'm convinced it was a portrait cake of the recipient Kelly. The quality is just too GOOD for this to be an error! 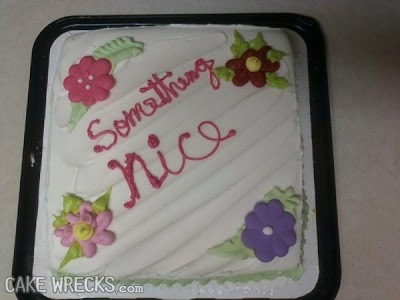 Love the site, its amazing how many fails on cakes exist. 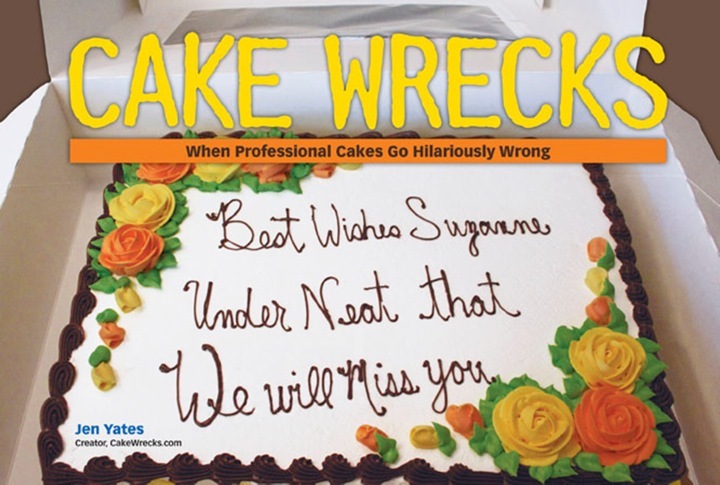 You can get a good laugh from reading some of the bakeries errors.